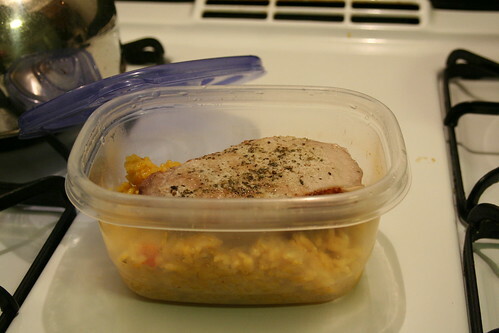 The best way to be sure I won't cheat at lunch time is to save myself some leftovers from dinner the night before. Tonight I broiled some pork chops, cooked up some brussel sprouts (not pictured because I ate them ALL, yummm) and made a delicious gluten-free rice mix from Thai Kitchen. I made the Thai Yellow Curry which was delicious. Thai Kitchen sells a lot of gluten-free options and they are available at my regular grocery store which is awesome. They also have this handy allergy info chart on their website and gluten is the very first item on the chart. I'm a BIG fan of Thai kitchen. So far I haven't found a single item that I haven't liked.